bhIShma spoke in response to these six questions (bhIShma uvAcha). In the process, he first replied to the last question, and then on proceeded to answer the other questions in a different order. Since the final goal is to be attained by some means, he first chose to reply to the questions regarding the means. Even among them, although asked at the very end of all questions, he chose to answer to the question regarding the japAlambanam (support of the verbal chanting) at first, which shows his high regard towards it. ‘nAmasahasrENa’ – with the thousand names that can be taken as a verbal support by chanting. ‘sthuvan’ – as per the ashtAdhyAyi sUthra 3-2-126, there is a a shatRu (शतृ) adjunct because of it ‘being a reason’. This is related (as a reason) to the statement “He shall surpass all the miseries” (sarvadhu:khAthigO bhavEth सर्वदुःखातिगो भवेत्). The word ‘sthavanam’ means that which removes all sorrows. Who is such a One (who transcends miseries upon recitation)? It is the ‘puruSha’. ‘puruSha:’ – the knowledgeable (here, refers to the individual soul – jeevAthmA). Of what nature is He? He is ‘sathathOththitha:’. (Such a soul is considered ‘ever awake’ due to his realization that) The constant prayer of such Supreme Entity with words of praise and uninterrupted thoughts will yield the most desirable and favourable fruits, while any interruptions to such actions bring untold misery. The vEdhas popularly declare: “When this knowledgeable soul takes refuge in the Supreme One who is unseen with the naked eyes, who has no body made out of prakruthi, who is not reached by words, and who is unsupported by any external entity, he is then firmly rooted in assurance against all fears, and reaches a state of fearlessness. But when he loses interest in contemplation of that Supreme Self, and distances himself from it, he begets the biggest fear of samsAra” (yadhAhyEvaiSha Ethasmin… यदाह्येवैष एतस्मिन्… – thaiththireeya upaniShath). Thus speak the vEdhas and other supporting scriptures in connection with the ‘japa Alambanam’ as the means of attaining a goal. “We wish to worship this supreme soul who possesses all wealth, who is the supreme master, the father, the preceptor, and the one who is fit to be worshipped. All of you should agree to this.” (sabhA parva) (tham imam sarvasampannam AchAryam pitharam gurum | archyam archithum ichchAma: sarvE sammanthum arhatha). ‘yajamAna:’ – by performing the dhEva-pUja / rituals of worship of the Lord; knowing no favour in return for the greatest favour that the Lord has done unto him – of accepting him into his fold, ‘yajamAna’ is the one who does an extraordinary, continuous and most affectionate service of the Lord with all beautiful items collected with pure devotion such as scented water, flowers, a mixture of honey and fruits, et al. by performing servile actions in various forms including touching the Lord, talking to Him, and offering him many enjoyments (bhogas) as per His wishes. Such a practitioner (yajamAna) will surpass all the difficulties and sorrows in his life (as said in ‘sarvaduHkhAthigO bhavEth’). “One must repeatedly think about the Supreme Self” (Avruththirasakruth upadEshAth). The commentator of the sUthras has stated thus: “vEdhanam or knowledge refers to upAsanam or worship, since the vEdhas say so”. Maturity in such upAsanA or worship itself is termed as ‘bhakthi’ or devotion. Bhakthi is not anything else outside of this. How do we say this? It is because it is not any different from the perception of spiritual union. This entry was posted in Other, sahasranAmam on October 19, 2017 by Sarathy Thothathri. Having heard fully about all purifying dharmas in detail in the battle field, yudhiShTira asked the glorious son of shAntanu [bhIshma pitAmaha] further. dharmAn – all the dharmas that are of varied kinds, mentioned in the vEdhas and smrithis, which bestow upon the followers a multitude of auspicious spiritual and material benefits – such as the rAja dharma (duties of the king), mOksha dharma (duties to be observed by a seeker of salvation), dhAna dharma (duties of a donor), and many more. ashEShENa – in entirety, meaning – as much as needed. pAvanAni cha – along with purifying deeds such as penance, pilgrimage, worship, et al. sarvasha: – in all respects; meaning – in terms of fruits, limbs, nature and authority of the prescribed actions. punarEva abhyabhAShatha – asked again. The reason for asking again was to know from bhIshma about the dharma that he held close to his heart as the highest of all. This can be known from the fact that he later asks bhIshma “which – of all dharmas – do you think is the supreme?” [Reference: the next two verses in series]. Also, yudhistira considered the fact that the wise men search and seek refuge of other learned men who are strongly rooted in the ancient good practices (sadhAchAra). Being subservient to them, the seekers also engage in similar practices that are most liked by their preceptors – the learned people. In the process, the seekers also develop a taste for those good deeds and fruits. That is to say, they do not engage in the most lofty deeds for the mere reason that it is stated in the scriptures, but because such deeds have been accepted and practiced by other learned men in the past. It has been already stated [at the very beginning of the introduction post] that the wise men should distinctly identify the subjects of knowledge from the various sources available to them, and accept only those that prove to be conducive for their welfare. Such knowledge is of two types – upAya (means) and upEya (goal). The means and the goal can further be thought to be of three types: likeable, more likeable and most likeable ‘goals’; and beneficial, more beneficial and most beneficial ‘means’. Of these, the goals usually have their own obstacles such as birth, growth, transformations, transient nature, the various effects on the soul namely sorrow, fruits of action, ignorance, desires etc. All these are considered to be the drawbacks of the goals. Similarly, they also have their share of positives such as being free from blemishes, developing taste for soul and body, permanence, abundant knowledge, bliss, wealth etc. The means also have drawbacks such as deterioration, exhaustion, being long-routed, deception, being over-rewarding or under-rewarding etc. The good qualities of the means are: being definitive, safe, and easy to follow, being extremely rewarding etc. The distinction in the aforesaid three types of goals and means is achieved keeping in mind the qualities and drawbacks of each of them, as discussed previously. When a seeker finds the ‘most beneficial’ way, he should give up the other two ways namely ‘beneficial’ and ‘more beneficial’, considering them as lowly in comparison to what he holds. Similarly, when he finds the ‘most likeable’ goal, he should give up the two other lower categories of goals namely ‘likeable’ and ‘more likeable’. The true seeker should understand the need for rightly judging between the various goals and the means and holding on to the best out of them. Having known that the various means lead to an ultimate goal, yudhiShTira proceeded to inquire about the ultimate goal at first. Since the philosophies and scriptures have projected and preached about the ultimate goal in two forms namely ‘The Supreme Entity’ and ‘The Ultimate Destination’, he inquired about the ‘Supreme Entity’ at first. yudhiShTira asked ‘Which is the Supreme Godhead shown by the scriptures? and who is the one whom we should attain?”. The words “Which” (kim) and “in the scriptures” (lOkE) are to be read along with every question that yudhiShTira has asked. Similarly, the phrase “the loftiest in your opinion” (bhavatha: paramO matha:) should also be applied to all the six questions that he has asked, according to the ‘simha-avalOkana nyAya’ (just as a lion looks back at the way it has treaded after walking a certain distance). The “vibhakthi”s in each of the questions need to be modified as required while applying these aforesaid phrases in all the questions. The word ‘lOka’ has an origin as: ‘lOkyathE anEna’ (through which everything is seen), which indicates that the word ‘lOka’ in this context doesn’t refer to the world as it normally does, but refers to the ancient scriptures such as vEdhas, smrithis, and other SAsthras using which we see the Supreme Reality. The word ‘Ekam’ refers to the main entity that has no equivalent or superior power to it. This is in concord with the phrases “the Supreme One who is also the biggest effulgence”, “of that One who is the chief of the world” etc. This doesn’t stop at the nature alone (the word ‘Ekam’ doesn’t refer to the nature of being Supreme alone), but also represents the numeral ‘one’ as it normally does. The next word ‘dhaivatham’ – due to its connotation and the use of singular form of the word – does not eliminate its representation of the Supreme Godhead as well as singularity. No Godhead exists, which has no nature of its own or which is multiple in number (in other words, all Godhead entities are indeed one in number, and have their own nature). Thus, even though it is known that the Godhead being referred to is singular, the usage of ‘Ekam’ is made specifically, for which no other meaning can be deduced. So in this context, the word ‘Ekam’ holds a special meaning, which represents ‘the Supreme One’, and not just the numeral one. Further to this, he has asked for two things – ‘dhaivatham’ and ‘parAyaNam’ (Supreme Entity and Ultimate Goal). In order to know if the two are totally different from each other or refer to the same entity in different states, there is the usage of two conjunctions ‘vA’ and ‘api’ (‘or’ and ‘also’). The word ‘Ekam’, as before, refers to the entity (destination, in this case) being Supreme – with no equivalent or superior, untainted, and auspicious in nature, and hence being the ‘Most likeable’ goal. ‘ayanam’ refers to the goal/result; the one which should be attained. yudhiShTira, in this question, intends to inquire about the highest goal (parAyaNam) in everyone’s life that helps achieve immense benefits both in this world as well as the nether, in bhIShma’s opinion. Thus are the first two questions on the “Goal” (puruShArtha – the Supreme Entity and Destination) that needs to be attained by every soul. The manu smruthi declares: “Only by japa will a brAhmaNa attain all benefits/fruits; there’s no doubt about it. Whether a person practices anything else or not, he will be considered as a brAhmaNa only by his friendly nature”. The same scripture also says: “The worship with japa is ten times better than worship with physical objects”. Krishna, in his SrI bhagavadhgIthA declares: “I am the japa-yajna among the modes of worship”. Since the loftiness of verbal ‘japa’ has been established with such assurances, the other modes of worship with mind and action are not being inquired by yudhiShTira. ‘samsAra’ – refers to the main causes due to which the soul is bound in this creation, namely ignorance, fruits of action, habits, tastes / desires etc. The ‘janma’ and ‘samsAra’ are the two obstacles that are stopping a soul from attaining the ultimate goal of life called paramapadham. These obstacles will be warded off with the help of japa. The ‘mOksha’ or salvation mentioned in this context is representative of all other auspicious benefits, since the various scriptures clearly mention both material as well as spiritual benefits in plenty for the japas that they prescribe. Thus, beginning with phrases like “in entirety” (ashEShENa), “by all means” (sarvasha:) etc, and later on using more phrases such as “in the scriptures” (lOkE), “all humans” (mAnavA:), “auspicious material/spiritual benefits” (shubham), et al, these questions also clearly intend to highlight the best modes in terms of time, authority, limbs of action, and the fruits of action. This entry was posted in Other, sahasranAmam on October 14, 2017 by Sarathy Thothathri. May SrI parASara bhattar – the priest of SrIranganAtha and the glorious son of Sri kUraththAzhwAn (SrIvathsAnga) – confer upon me all auspiciousness in abundance. वन्दॆ गॊविन्दतातौ मुनिमथ मनवै लक्ष्मणार्यं महान्तम्. I salute gOvindha (embAr) and my father (kUraththAzhwAn), and meditate upon lakshmaNa muni (emperumAnAr) and mahApUrNa (periya nambigaL). I meditate upon yAmunAchArya (ALavandhAr), and fill my heart with rAmamiSra (maNakkAl nambigal). May I see puNdarIkAksha (uyyakkoNdAr), also along with the first preceptor nAthamunigaL (SrIranganAthamuni) – to whom I prostrate. I pray to SatAri (nammAzhwAr). May I see lakshmi (periya pirAttiyAr). 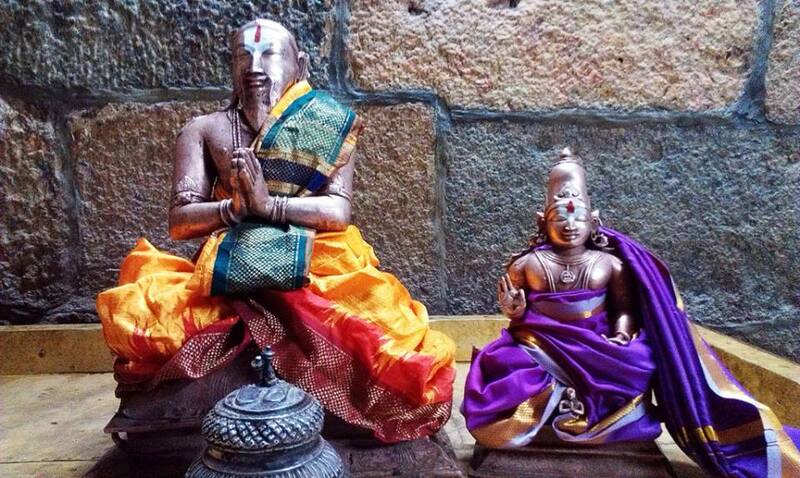 May I, who am with no other refuge, surrender to SrIdhara (periya perumAL). I first salute vishwaksEnar – the consort of sUthravathI and the commander-in-chief of SrIrangarAja, who rules us with many his assistants including the elephant faced one. I salute krishNa dhvaipAyana (vyAsa), who is nArayaNa himself, and who divided the vEdhas into four and also graced us with the fifth vEdham called mahAbhAratha. 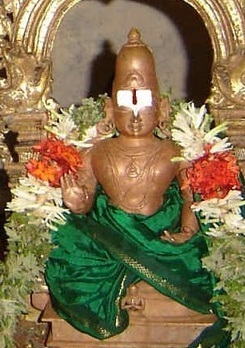 I, SrIranganAtha by name, the son of the great rishi SrIvathsachihnar (kUraththAzhwAn) – who considered the shelter of SrI rAmAnuja as the biggest wealth, later rechristened as parASara bhattar by SrIranganAtha Himself, have sought to elaborate on the thousand names of the lord SrIranganAtha in pursuit of the His grace, having been inspired by Himself. This samsAra (material realm) is full of people unlearned about the supreme self, more so in this age of kali. I have sought to an adventurous deed of elaborating the thousand names of the Lord to people who are full of arrogance, who think they know the secrets of vEdhas and upanishaths in completeness. 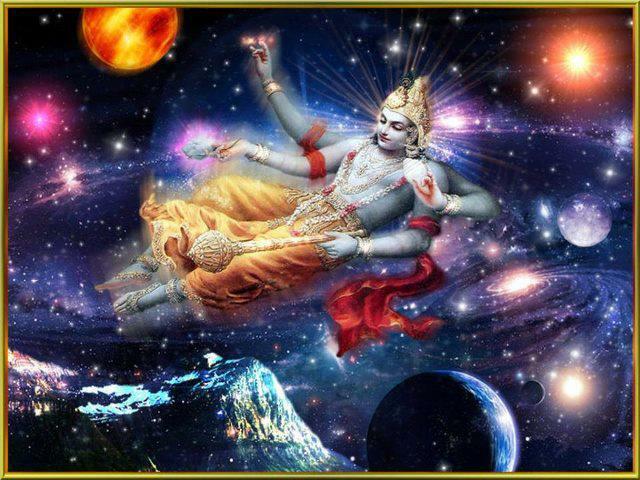 May vyAsa maharishi – who gave us this sthOthra of SrI viShNu sahasranAma, and SrI vishNu Himself – who is the subject of this sthOthra, tolerate this stupidity of mine. I prostrate and pray to you with folded palms please believe firmly in SrIhari as also in the thousand names that connote Him, as well as in me – who has resorted to elaborate their meanings. Please drink in this elixir of “SrI viShNu sahasranAma” (in order to be released from the clutches of samsAra). May there not be any mediocre people with hatred (lest they prevent others from enjoying the bliss of the thousand names). In this world, every learned soul should distinctly identify the subject of knowledge from the various available sources. If the subject of such knowledge is conducive to their welfare, they should happily accept it – just as they would accept beautiful jewellery, sandal paste and gold. If they determine the subject of knowledge to be marring their welfare, they should shun it – just as they would shun a blade or a thorn. If the subject of knowledge is known to be different from either of these options, it should be disregarded, just as a log of wood or a bag of sand. With this background, when we analyze the three pramANas namely prathyaksha (perception), anumAna (inference) and Agama (authentic scriptures), we conclude that the various subjects professed by them leading us to wealth (artha) and other material desires (kAma) are to be shunned due to their nature of being limited, spoiling, frightening, momentary, sadness-filled and difficult-to-earn, and hence being respite with unlimited faults. On the other hand, the qualities of righteousness (dharma) and salvation (parathathva/moksha) professed by the scriptures (SAsthras) are full of auspiciousness, and are opposite in nature to the former two. Hence the latter need to be sought by the learned people. The authors of ithihAsas and purANas (historical scriptures) unanimously declare thus: “It is true. It is true. We reiterate that it is true. With raised shoulders (palm over head), we repeat it is only true that there is no scripture higher than the vEdhas and there is no God superior to kESava”. vEdhas hold the prime position as the source of all the fourteen vidhyAs expounded by the ithihAsas and purANas. It is said that the vEdhas should be explained with the help of ithihAsas and purANas, without which the vEdha mAthA (SAsthram in the form of a mother) fears deception by the expounder. When the vEdhas are to be expounded thus, more prominence is given to ithihAsas than purANas. Among the ithihAsas, the learned people give the same prominence to mahAbhAratha as much as they revere SrImadh rAmAyaNa. Many learned scholars have accepted mahAbhAratha as the source of all knowledge, with special reverence. It has been accepted thus, due to its properties of flawlessness and crystal-clear elucidation. This has also been held in high esteem by the various purANas due to the fact that this is a historical account (and not just a story). “A brAhmaNa by knowledge of all four vEdhas, along with knowing the limbs of vEdhas as well as the upanishaths, would still be considered as unlearned as long as he has not studied the ithihAsa called mahAbhAratha in detail”. Since the mahAbhAratha is in line with vEdhas along with its limbs, smrithis (works born out of memory), ithihAsa and purANas, it is rightly said “What can be found here, can surely be found everywhere else; what is not found here will never be found anywhere else”. The mahAbhAratha – due to its expounding of all material and spiritual meanings in line with vEdhas in a fully unbiased manner – is studied by the most learned scholars as being superior to even the purANas. In the very heart of such mahAbhAratha is where the SrI viShNu sahasranAma chapter lies. This chapter is befittingly placed in the anuSAsanika parva, in the context of explaining the various righteous deeds such as charitable activities (dhAna-dharma) after discussing the various meanings in the SAsthras. This chapter truly lies as the essence of all the discussions regarding righteousness in this parva. 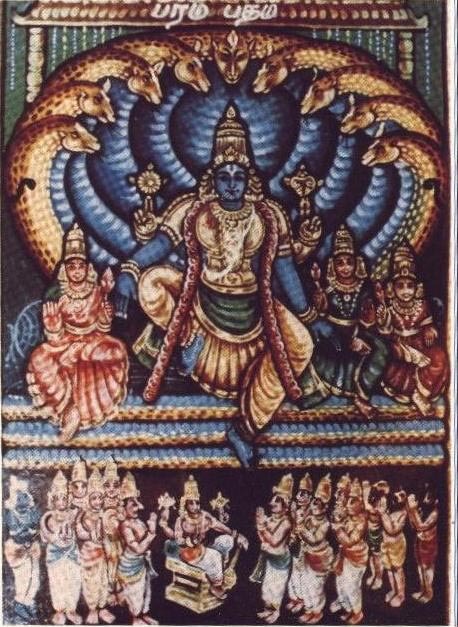 For all the aforesaid reasons, it can certainly be concluded that the SrI viShNu sahasranAma is one ultimate source of true knowledge, and that the true intention of this chapter is to preach the esoteric meanings of all the vEdhas. Also, since this is considered as a pramANa (source of knowledge) beyond doubts, and since it propounds the highest philosophy of all, the seekers genuinely in pursuit of true knowledge and their own welfare should give in to SrI viShNu sahasranAmam for the best results. The viShNu sahasranAma chapter has been sung by various sages with all devotion. This can also be stated as a sole reason for holding this chapter in high esteem. Also, the vEdhAchArya SrI krishNadhvaipAyana vyAsa maharishi is the supreme Lord SrIman nArAyaNa Himself – the most compassionate. Being an incarnation of the Supreme Lord, and hence possessing a multitude of auspicious qualities such as boundless knowledge, power etc, and also having no limiting qualities such as forgetfulness, confusions etc, He had the capacity to divide the vEdhas into four. With this capacity, He authored the fifth vEdha known as the mahAbhAratha in order to uplift the less knowledgeable people affected by the kali age. He authored the mahAbhAratha in order to clear all confusions and doubts that could be raised by the dull-heads due to their ignorance in practicing the principles laid down by the scriptures in this age. Being the great grandson of the glorious vaSishta maharishi – who, by his own words, made a warrior viSvAmithra perform penance and turn into a brAhmaNa (by knowledge); being the son of parASara maharshi – who gained the divine knowledge about the Supreme Self by the grace of vaSishta and pulasthya and hence authored many purANas and samhithAs, and who has also greatly gained accolades in many other purANas including linga purANa etc; having gained a high reverence among the most learned scholarly sages (parama rishis), due to His extraordinary penance, and experience of God; sage vEdha vyAsa has given us the SrI viShNu sahasranAma chapter with the thousand names strung into a sthOthra form, which were previously sung and glorified by the sages of the rank of vaSishta and parASara. Thus the vishNu sahasranAma chapter is to be considered as the most sacred and should certainly be sought by one and all. “Hey yudhishtra, if you wish to listen to all the righteous duties, go to the elderly and wise bhIshma pithAmaha. He – being the son of gangA, and the all-knowing wise man – will clear all your doubts in the esoteric scriptures. He is the one who has seen indra and other Gods in reality, and all the brahmarishis approach him as his audience (in learning the deep hidden meanings in the scriptures). There is nothing that he doesn’t know. He is full of knowledge, and can clear all your doubts”. krishNa has also addressed bhIshma thus: “Oh bhIshma, that which the pANdavas ask you and that which you advice them to follow would be well rooted in this Earth as the very own words of vEdas for all the future generations to benefit from. All that has happened in the past, all that happens in the future, and all that is happening right now are clearly known to you – the most learned – like a fruit in your palm. I (The Supreme Self) know what you are! With the powers that you have gained out of your penance, you are capable of creating all worlds and all creatures in them. Your powers know no contraction; your knowledge has no taints. Your mind is well rooted and always residing in sattva guNa. It is untouched by rajas and thamas, and is distinctly shining like the moon in the sky that is untouched by the passing clouds. Sage nAradha has spoken thus, in praise of bhIshma: “All dharmas that need to be known by all four classes of people – brAhmaNa, kshatriya, vaishya and SUdra – are known to bhIshma. So rush to him and get all the doubts nested in your minds cleared right away”. Having praised bhIshma as the one who has spent his lifetime serving many learned sages and the elderly people, the one who has strictly adhered to the vow of celibacy for a long time, the one who has performed penance and the one who has attained a spiritual union with the Supreme Self and thus possesses boundless knowledge, bhagavAn nAradha has granted him the powers to profess the supreme philosophy and righteousness in this world, and has appointed him for this purpose. By the blessings that he obtained having served his parents, bhIshma has himself spoken thus: “Hey gOvindha! Thirst, passion, weakness and pain have all subsided now by your grace. Hey achyutha! All the past, present and future are now known to me as clearly as a fruit in my palm, by your divine grace. All dharmas spoken in the vEdhas and upanishaths are now seen by me due to your grace, oh achyuta! 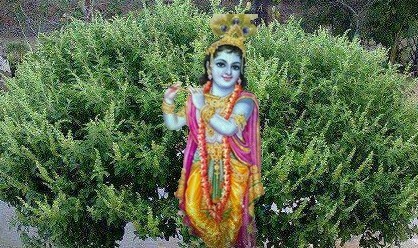 Hey janArdhana, having meditated upon you endlessly, I am now as energetic as a youth. I have now become capable of preaching the dharmas that bestow welfare to this world, and this – again – is by your grace!” Having spoken thus, bhIshma has clearly indicated his knowledge of the Supreme Self. Such well learned bhIshma has declared “This is – in my knowledge – the best of all dharmas”. Thus, the vishNu sahasranAma is to be considered as the most sacred and sought by one and all. The vishNu sahasranAma chapter has been well accepted by everyone in this world due to its greatness. Thus, bhagavAn athri maharishi has addressed the Supreme Self as ‘the God with thousand names’ in the sabhA parva of mahAbhAratha, and thus upheld the greatness of the sahasranAma chapter. Even in the vishNudharmam, the Supreme Self is referred thus during SrI gajEndhra-mOksham: “The one with thousand auspicious names, the absolute cause of all creations, the one who has no births (due to karma) and the all-pervading Self”. Even here, the great limitless auspicious qualities of bhagavAn are expounded – both at the beginning and at the end of the work. Even in many other material and spiritual sciences such as Ayurvedha, the greatness of the thousand names of the Lord are extensively discussed. The charaka samhithA, for instance, declares thus: “A sick man would be free from all diseases if he sincerely prays to vishNu – the thousand (infinite)-headed, the ruler of all moveable and immoveable entities, and the all-pervading Self – with His thousand names”. Even in the current times, the remedies to various urinary complications indicate the chanting of purusha sUktham at first, and also strongly recommend chanting of the thousand names of the Lord contained in the mahAbhAratha. The chanting of sahasranAma – the thousand glorious names of the Lord – has been suggested as a sure remedy to various respiratory disorders as well. As a remedy to various kinds of fevers, the scriptures recommend performing the oblations (hOmas) as detailed by them, followed by chanting of the vishNu sahasranAmam. The remedial procedures for planetary positions also suggest the chanting of SrI viShNu sahasranAma in addition to the maruth-sUktham. It is further recommended that the true seeker search for more of such proofs as desired. Even the ordinary poets and other mortals also project these thousand names of the Lord as the saviour of all lives. For instance, bhattabANa – while picturing the maternity room – says that the vishNu sahasranAma is chanted endlessly. These thousand names of vishNu are considered as the best for listening, chanting, singing, writing, commenting, and sincere worshipping. Chanting of these names is the best suited remedy for curing all types of difficulties posed by poisons, demons, diseases, planets, bad dreams, bad omens, and all other inauspicious entities in this world. It is also considered the best for gaining both material and spiritual benefits, releasing oneself from the bonds of this samsAra, reaching the Supreme abode SrIvaikuntham of vishNu, as also in enjoying the sweetness of the nectar of the divine qualities of vishNu to the fullest. This is also considered as the best for all classes of people such as children, the dumb, the stupid, women, and the non-believers of God. It is in fact considered as the best medicine for all these classes of people. Such wide acceptance is not found even for the vEdhas, since the ignorant wouldn’t accept them, and also since the vEdhas have wide restrictions in terms of who can study them and who cannot. Thus, the vishNu sahasranAma with such wide acceptance should certainly be sought by the wise. 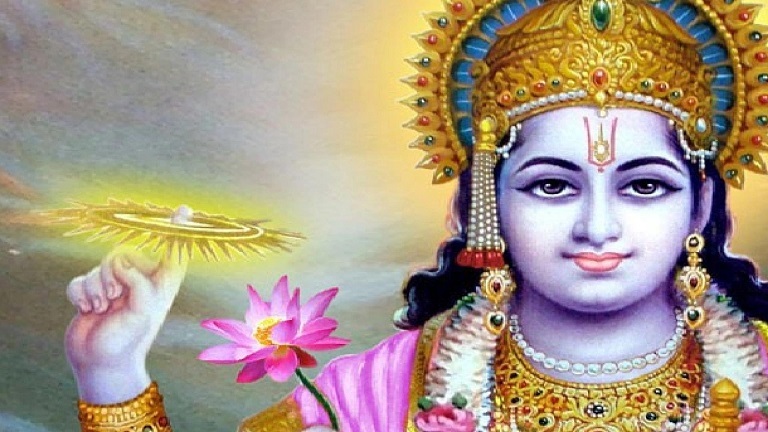 SrI viShNu sahasranAma chapter provides us with the same meanings as expounded in the other parts of mahAbhAratha, namely SrI bhagavath gIthA, nArAyaNIya, yAna sandhi, agra pUjA, uththama anushAsana etc. Even for this reason, the sahasranAma adhyAyam is to be considered as very sacred and sought by the wise men. 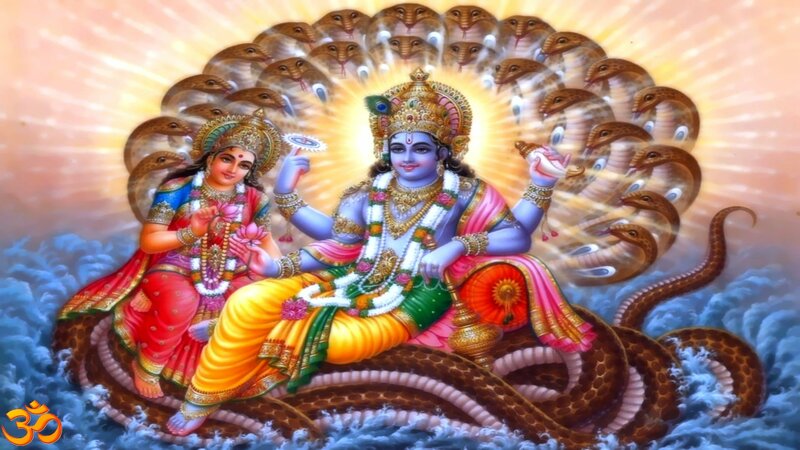 In light of the six reasons as detailed here, it can be concluded that the chapter of thousand names of the Lord – SrI viShNu sahasranAmam – should be studied by one and all for their own benefit. In addition, the initial discourse on the thousand names of vishNu by bhIshma pithAmaha in the war field from the arrow-bed was graced by the greatest of sages like vyAsa, dhEvashravas, dhEvasthAna, nAradha, vAthsya, Ashma, sumanthu, and other brahmarishis and dhEvarshis – who are the authorities of all knowledge expounded in the vEdas – as his audience. The session was also attended by none other than the Master of all, the expounder of SrI bhagavath gIthA (gIthOpanishath), the foremost among the Acharyas, the Lotus eyed bhagavAn SrI krishNa Himself, and was accepted by Him as a prayer par excellence. I seek to write a treatise on these thousand glorious names of bhagavAn – the vishNu sahasranAma adhyAyam – with an intention of elaborating on His most auspicious qualities. This entry was posted in Other, sahasranAmam on July 6, 2017 by srinivasarajan. 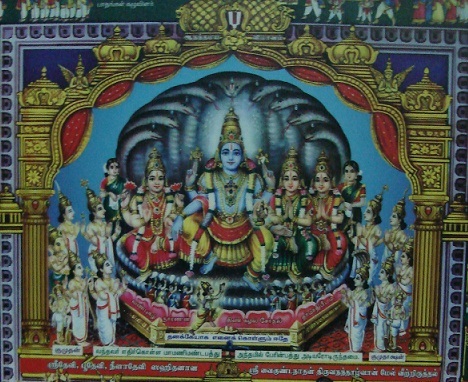 maNavALa mAmunigaL who is considered as yathi punaravathAram (re-incarnation of emperumAnAr (SrI rAmAnuja)) glorifies nammAzhwAr as “vEdham seydha mARan” in upadhESa raththina mAlai 14th pAsuram, explaining that nammAzhwAr presents the essence of vEdham in simple and beautiful thamizh language. Such nammAzhwAr highlights in thiruvAimozhi 2.5.6 “pala palavE AbharaNam pErum pala palavE pala palavE sOdhi vadivu paNbeNNil” (emperumAn has many many ornaments, many many names, many many forms and qualities), in thiruvAimozhi 8.1.10 “thOLgaL AyiraththAy! mudigaLAyiraththAy! thuNai malark kaNgaL AyiraththAy! thALgaLAyiraththAy! pErgaLAyiraththAy!” (Oh one with thousand shoulders! Oh one with thousand heads! Oh one with thousand lotus like pair of eyes! Oh one with thousand divine feet! Oh one with thousand names!”) and in thiruvAimozhi 9.3.1 “pErAyiram koNdadhOr pIdudaiyan” (the one who is having the unique greatness of having thousand names). This is in line with how bhagavAn is explained in the most important hymn of vEdham which is purusha sUktham, where bhagavAn is described as “sahasra SIrshA purusha: | sahasrAksha sahasra pAdh |” (the supreme lord is with thousand heads, thousand eyes and thousand feet). Here thousand indicates the countless nature of his limbs, features etc. The whole of thiruvAimozhi is focussed on emperumAn and his auspicious qualities. Each name of emperumAn is reflective of a particular quality. For example, achyutha indicates the quality of not abandoning his devotees, anantha indicates the quality of being infinite and so on. 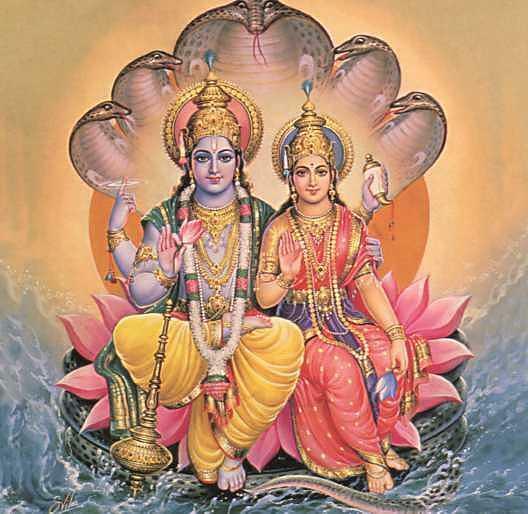 SrIvishNu sahasranAmam is a divine hymn which is part of mahAbhAratham. 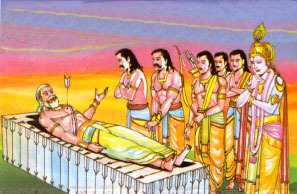 bhIshma pithAmaha, laying down on the arrow bed, instructs to pANdavas, the highest principle of meditating upon bhagavAn’s auspicious qualities through his divine names. parASara bhattar, the celebrated son of kUraththAzhwAn, one of the most important among the direct disciples of emperumAnAr, compiled an elaborate commentary for SrIvishNu sahasranAmam. This divine treatise is named as “bhagavath guNa dharpaNam” (A mirror revealing the auspicious qualities of bhagavAn). It is our desire to explore the wonderful meanings of this treatise and present an english translation of the same for the benefit of the devotees of SrIman nArAyaNa. We pray unto the divine feet of Sriya:pathi, AzhwArs and AchAryas and begin this effort as a humble offering at their divine feet. This entry was posted in Other, sahasranAmam on June 8, 2017 by Sarathy Thothathri.